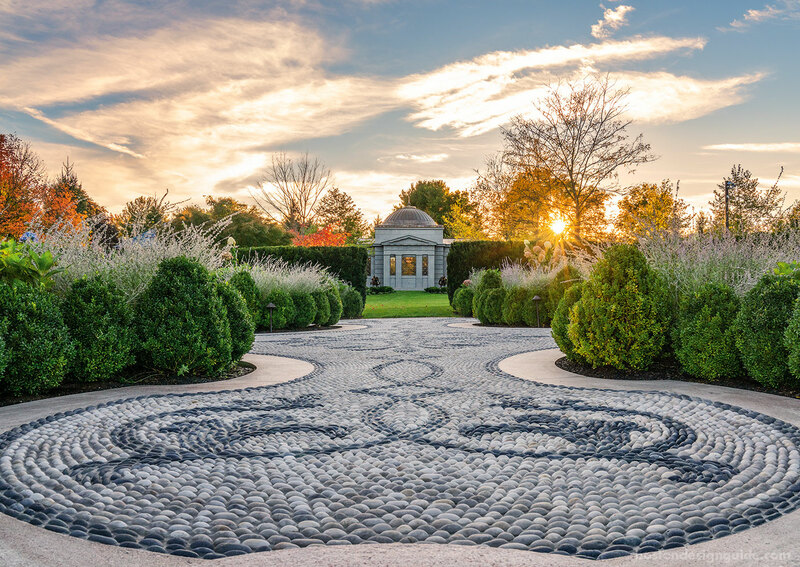 Comprised of contrasting Mexican beach stones, the Pebble Terrace is undoubtedly the jewel of an expansive and picturesque landscape designed as a series of outdoor rooms by landscape architect Brian Frazier of Brian Frazier Design. 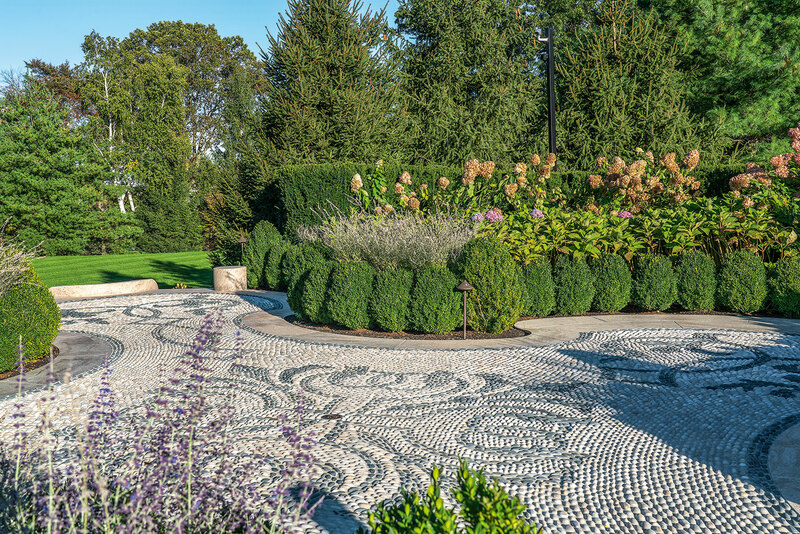 The singular yet intimate space is directly on axis with Boch’s Garden Pavilion, which was designed by Eric Inman Daum Architect and built by KVC Builders, and fringed with layers of taxus, hydrangea, Russian sage and boxwood. Project Manager Chris Johnson of R.P. 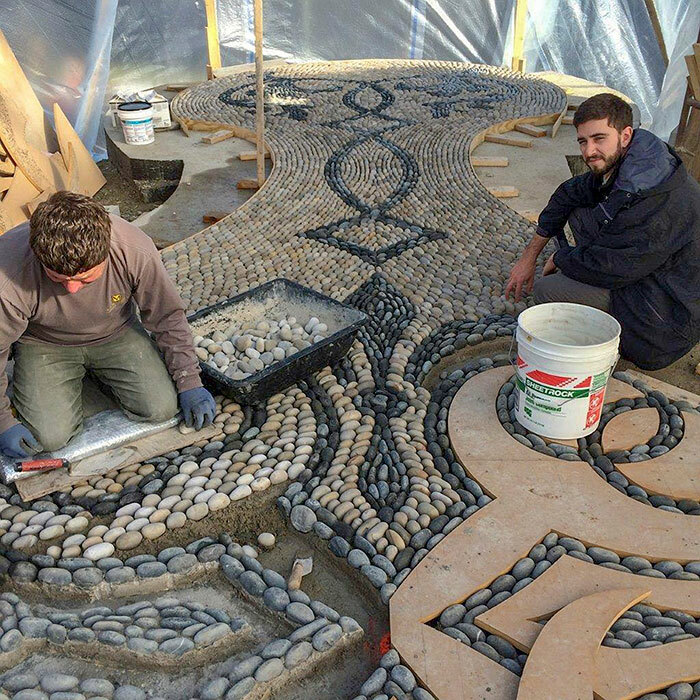 Marzilli & Company, the landscape contractor that handcrafted the Pebble Terrace, shares that he “has never done anything so intricate or custom on a flat terrace like this—personally or professionally.” He applauds Frazier’s design, and takes us behind the scenes to see what it took to bring the one-of-a-kind terrace to life. Prior to foundations for the garden pavilion and pebble terrace, a series of drainage and sewerage line for the garden pavilion were run directly below the pebble terrace. Excavation for this work was significant. The team had serious concerns about settling. Walsh completed this work and compacted the backfill in lifts to ensure no settling would occur. This work went through the "lower lawn" and R.P. Marzilli & Co. sodded it Thanksgiving eve. 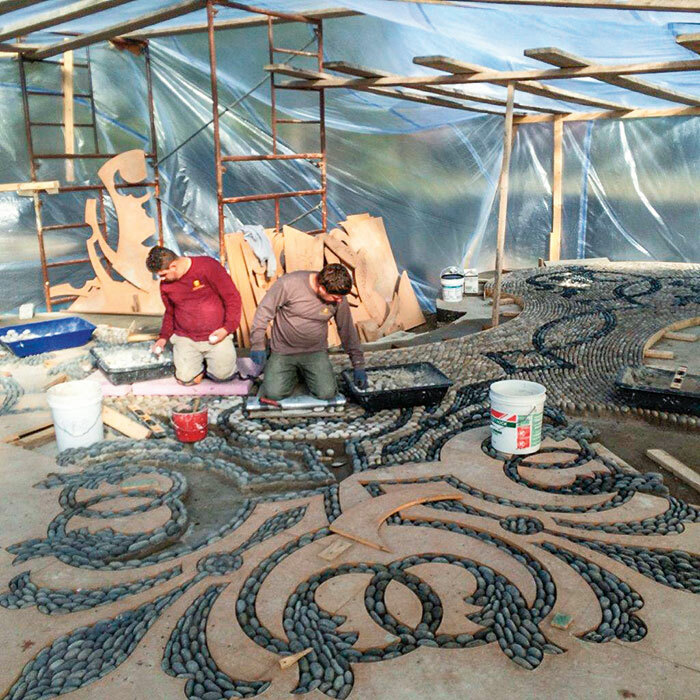 After four-foot vertical forms were installed, the shape of the pebble terrace started to come together. 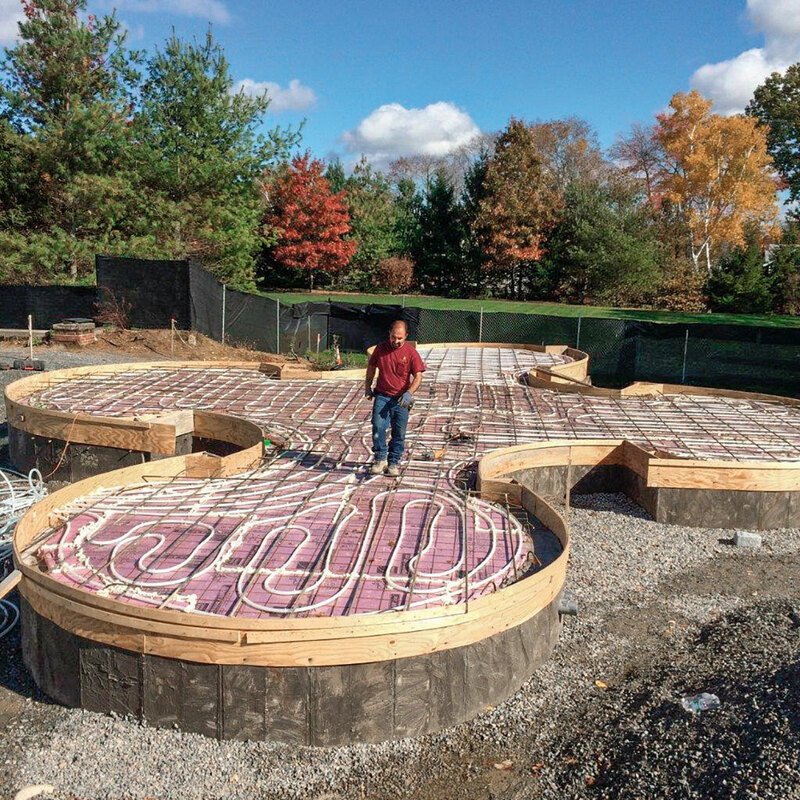 The stem walls were reinforced, infilled and crowned by a topping slab, outfitted with a snow melt system within the concrete, to ensure the terrace won’t accumulate snow. R.P. Marzilli’s team determined that the best way to approach the design was to work outward from an interior starting point, in a ripple effect. South Shore Millwork cut forms from AutoCad templates to allow the craftsmen “to stay on the central axis and keep everything absolutely perfect,” says Johnson. Not only did the terrace have to be centered, the stones needed to radiate following the geometry of the design. 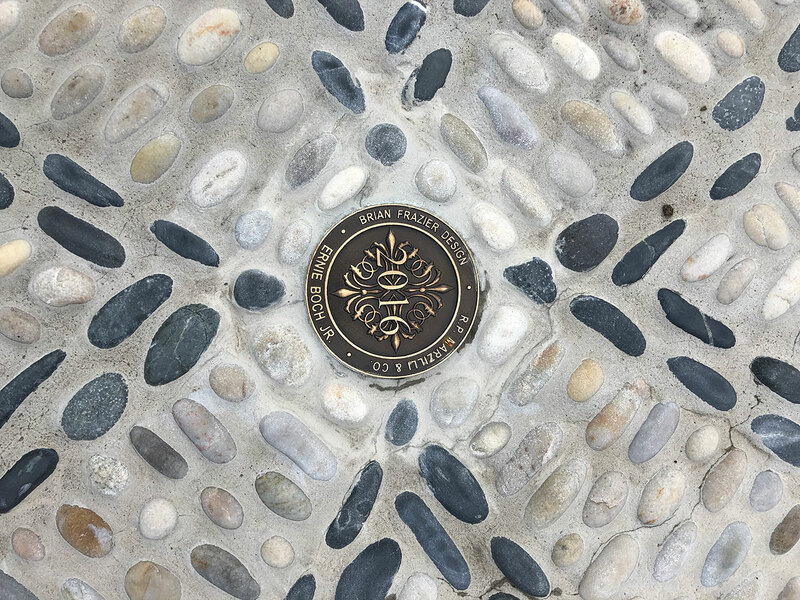 For the grouting, the team went though multiple mockups using different grouts and mortars until they landed on the product they wanted. The depth of the mortar on each stone influenced the final look. The “jointing was critical in making the terrace come together,” emphasizes Johnson, and the team went slowly, section by section, for this finishing touch. 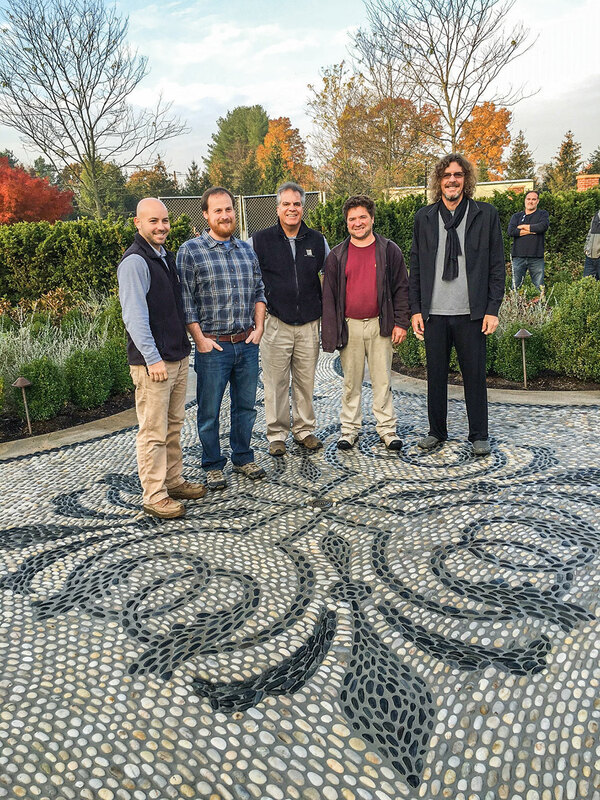 Pictured left to right: Project Manager Chris Johnson; Landscape Architect Brian Frazier; President Bob Marzilli; Master Stone Mason and Field Supervisor John Dias; and Ernie Boch, Jr.
At the project’s completion, the team gathered as if for a ribbon cutting as Ernie Boch, Jr. pressed a medallion etched with the date, his name, Brian Frazier Design and R.P. Marzilli & Co. into fresh concrete. R.P. Marzilli & Company was honored that Boch had their name emblazoned, and it was more rewarding still, says Johnson, when Boch shook the hands of everyone on the design team and offered a heartfelt thank-you for their hard work.